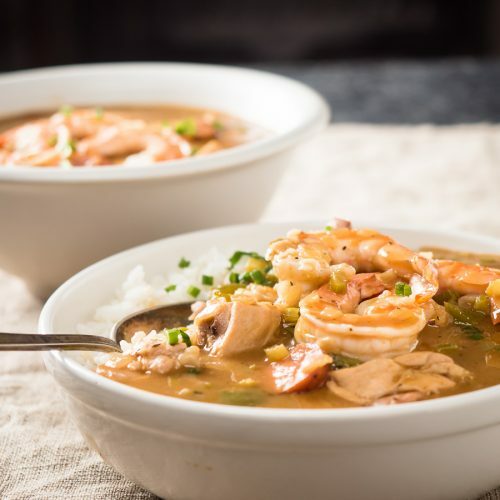 This is old school roux based gumbo loaded with chicken, shrimp and sausage. This is how you avoid rubbery overcooked shrimp. Prepare an ice bath (ice and water) and have it handy. Thaw and peel your shrimp. Bring about 6 cups of water to a simmer. Add enough salt to get it to taste salty. Somewhere around 1 tsp should do it. Add the shells from the shrimp to the pot and simmer for 20 minutes. Remove the shells from the pot. Make sure it's simmering. Add the shrimp, turn off the heat and cover. For 16-20 count, let it sit 8 minutes. 21-25 takes 7 minutes. 31-40 are ready after 6 minutes. Once the appropriate time has passed remove the shrimp from the pot and place them into the ice bath to stop them from cooking any more. Perfectly done shrimp every time. This is the heart of the gumbo. It takes time. It requires constant attention. It's a little dangerous. And it can go wrong quickly. Never walk away from your pot. Have your onions, green pepper and celery chopped. Keep the onions separate. Combine your spices in a small bowl and set aside. Warm your chicken stock. You will need it to be warm as soon as the roux is done. Cut your chicken into large bite size pieces. Season it well with salt. Heat the oil in a solid pot over medium low heat. Cast iron or enamelled cast iron is great for this. Add the oil to the pot and heat until shimmering. Add the chicken to the oil carefully. Fry half the chicken until it starts to brown. You aren't trying to cook the chicken the whole way through - just brown it a bit. Remove the chicken and set aside. Repeat with the rest of the chicken. Now make sure your oil is shimmering but not smoking. Add a couple tablespoons of flour and whisk into the oil. Add another couple tablespoons and whisk. Now add half the remaining flour and whisk it in. Repeat with the rest of the flour. Now whisk. And whisk. Whisk some more. Never stop whisking. Have somebody bring you a drink. You are going to be here for about 30 minutes. Roux takes time. You can nudge the heat up a bit at a time but you have to be careful. Burn it and you are starting over. Black flecks in your roux and you are starting over. There's no fixing a burnt roux. When you start getting close the roux smells like popcorn. At least it does to me. The closer you get the stronger the popcorn smell. When you get just a bit darker than peanut butter move your pot off the heat. Carefully add the onions and stir immediately. Remember, this is hot oil with flour in it. It will burn you badly. They don't call this cajun napalm for nothing. Be safe. Something really cool happens when the onions go in. The roux almost immediately turns the colour of caramel. No clue why but it does. Darkens up quite a bit. No need for alarm. Cook the onions over low heat for about 3 minutes. Add the spices and stir. Mix in the celery and green pepper and cook until soft. This takes a few minutes. They are soft when they are soft. Toss in the garlic. Cook for another 30 seconds, stirring constantly. Add a half cup of warmed stock. Stir until combined. Add a second half cup and repeat. Now add a cup and stir. Add the remaining stock. Simmer the gumbo base for 20 minutes. While the gumbo base simmers slice the sausage. After the gumbo base has simmered for 20 minutes mix in the chicken. Cook until barely done. This will take somewhere between 10-20 minutes depending on how big the pieces are and how much they were cooked in the oil. As always an instant read thermometer is your best bet. Shoot for 170F. Add the sausage and simmer for an additional 3-5 minutes. Just before serving mix in the pre-cooked shrimp to warm through. Serve with rice (traditional) or with bread (not traditional but really good). Garnish with a bit of finely chopped green onion if desired.